A 35-year-old female patient has been on V-A ECMO for the last 8 hours for cardiogenic shock following witnessed PEA arrest with ROSC. She continues to require high dose ionotropes and has developed severe acute kidney injury (AKI) (Cr 250, eGFR 20) and a persistent lactate acidosis (Lactate 9 mmol/L). Q1. How common is AKI on ECMO, and what are the causes? The incidence of AKI on ECMO is >80%.1-3 Acute renal failure may occur in up to 35% of patients (as per RIFLE criteria)1-3. AKI may occur prior to, or during, ECMO. Prior to the initiation of ECMO, sepsis, low cardiac output syndrome, exposure to nephrotoxic agents, and high intra-thoracic pressures may all contribute4-8. The duration of hypotension may be a specific modifiable risk factor. After initiation of ECMO, infection and new-onset sepsis, congestive heart failure, and fluid overload may contribute to AKI4-8. Q2. How does the initiation of VA ECMO may impact renal function? In VA ECMO, cardiac output is a mixture of native cardiac (i.e., pulsatile) flow and ECMO pump (i.e., non-pulsatile) flow. The institution of non-pulsatile VA-ECMO blood flow usually raises diastolic and systolic blood pressure, and may also reduce central venous pressure. Both of these factors improve renal perfusion. Veno-venous ECMO maintains native pulsatile cardiac output, and changes in renal perfusion are less than in VA-ECMO. After the initiation of ECMO, oxygenation improves, oxygen consumption reduces, and hemodynamics improves in most patients. However, the initiation of ECMO (especially in neonates and children) can also cause rapid hemodynamic fluctuations that alter renal blood flow and lead to ischemia and reperfusion associated AKI9-10. Other factors associated with ECMO initiation predispose patients to incident AKI or exacerbation of AKI. Blood exposure to artificial surfaces causes systemic inflammation and hemoglobinuria induced renal injury due to different degrees of hemolysis occur in the extracorporeal circuit10. Q3. 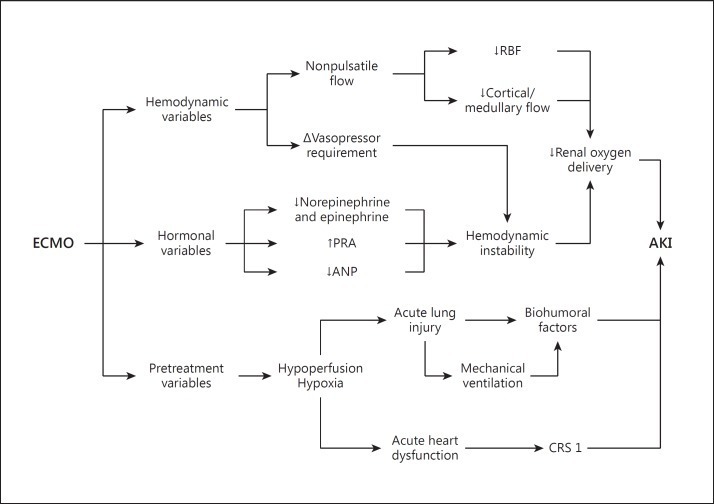 What are the options for treating fluid overload during ECMO? Diuretics are mostly venodialators, cause dyselectrolytemia and alkalosis and may not be sufficient to achieve desired results. They have been associated with worse outcomes in AKI. A membrane or filter is connected in line with the ECMO circuit. Approximately 4-5 L of fluid can be removed each day. This won’t remove potassium however, and bicarbonate is lost and may need supplementing. Q4. How can CRRT be connected to the PLS ECMO circuit? The PLS circuit allows for both access and return points for the CRRT to between the pump and the oxygenator (see Figure 2). The return is always positioned preoxygenator. This enables the oxygenator to act as a filter (much the same way the lung works) to minimize the risk of air/clot embolism entering the patient. Fig 2. 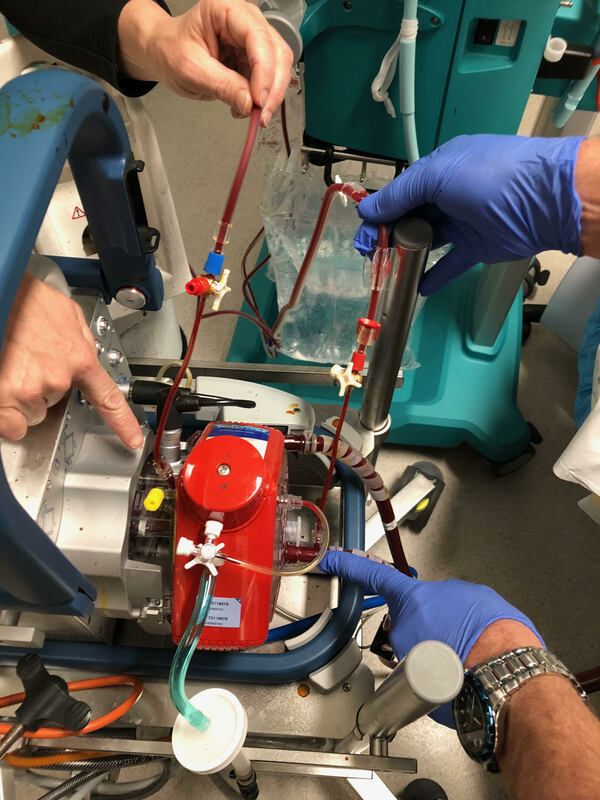 In‐line connection of the hemodiafilter to the PLS ECMO circuit: inflow of the CRRT to a venous line just after the ECMO pump (in its close proximity) and outflow of the CRRT to a venous line closer to the oxygenator (just before the oxygenator). Circuit diagram (top) (Image source: Seczyńska et al, 2014; click image for source). and photograph (bottom). Q5.How can CRRT be connected to the HLS ECMO circuit? The only points of access in a HLS circuit are the points where pre- and post-oxygenator samples are collected. At the Alfred ICU we use the post oxygenator sampling point as the access for CRRT and the pre oxygenator sampling point as the return line for CRRT to avoid returning any blood post the oxygenator. 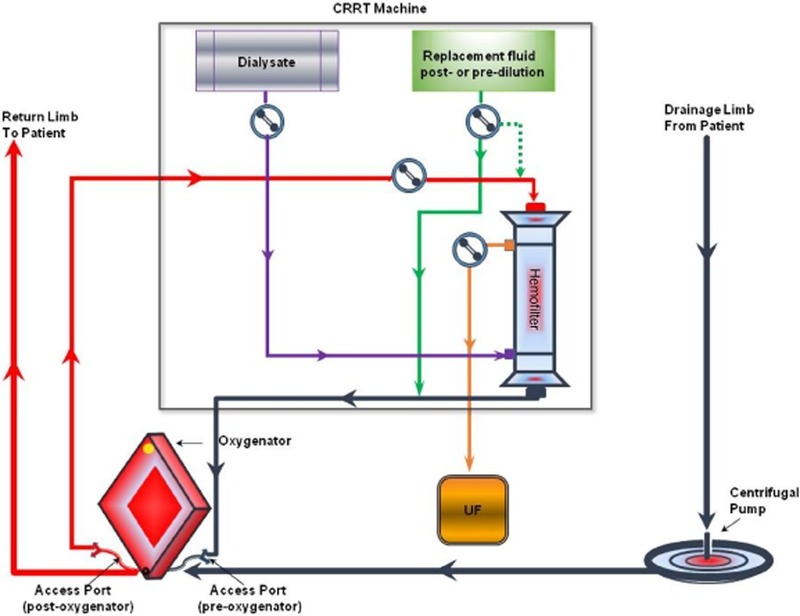 The advantage of this approach is that any air or clot from the CRRT is first filtered through the oxygenator before being returned to the patient. 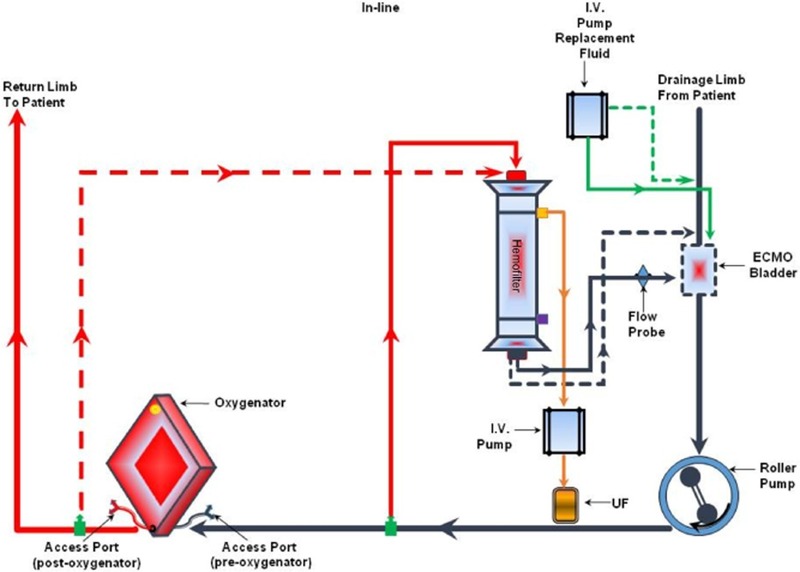 The disadvantage of this approach is it results in approximately 200-300 mL/minute of recirculation of oxygenated blood back into the pre – oxygenator circuit, resulting in some reduction in efficiency. It is however small compared to overall ECMO blood flow of 2-5 L/min and is usually clinically negligible. Fig 2. 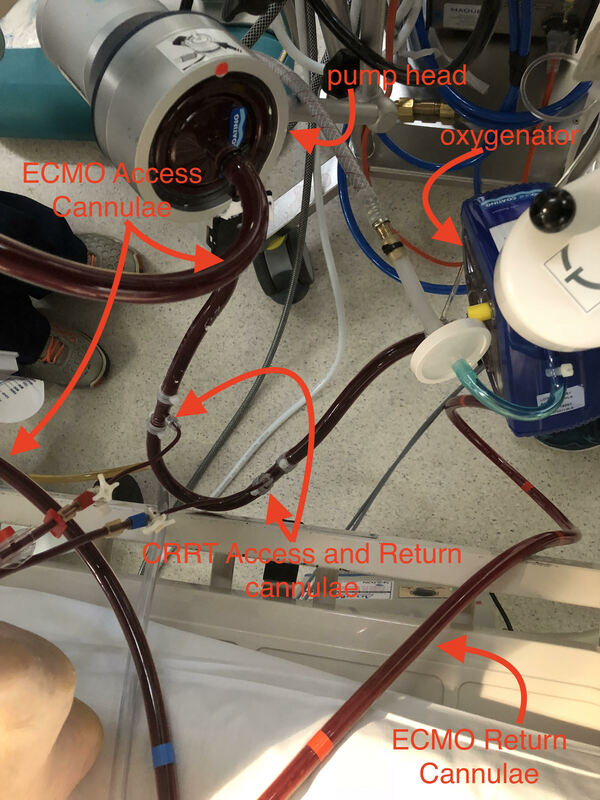 In‐line connection of the hemodiafilter to the HLS ECMO circuit: the inflow of the CRRT circuit to the arterial (return) line of ECMO just after the oxygenator, the CRRT outflow to the venous line of the ECMO circuit just before the oxygenator. Circuit diagram (top) (Image source: Seczyńska et al, 2014; click image for source). and photograph with gloved hands holding up the access line (post oxygenator) for CRRT and ungloved hands showing the return point(pre-oxygenator) (bottom). The patient described above had continued to require high dose ionotropes and significant flow rates on ECMO (up to 4-4.5 L/min) without evidence of good pulsatility and with ongoing lactic acidosis and persistent AKI, required ‘high dose’ dialysis. Q6. What issues can affect the function of the CRRT machine? In an ECMO CRRT circuit, both the access and the return line are on the positive pressure side of the pump. This can cause problems with high-pressure alarms on the CRRT machine (especially on the return side) such that the CRRT cannot proceed. The Alfred uses an upgraded Software version (version 7.11) of the Prismaflex (Gambro, Sweden) CRRT machines. This set up allows the user to select a positive pressure access when the treatment is initiated without the need for any additional user input. The Prisma machine can function with return pressures of up to 350 mm Hg and, is sufficient for most patients. However, higher pressures may be encountered on the return limb with ECMO flows >3.9l, overcoming the usual operating range and causing it to alarm. This can be overcome by inserting a separate return catheter into a large bore vein (ie 16guage cannula in cubital fossa). Q7. Do patients on CRRT and ECMO require additional anticoagulation? Most ECMO patients are already anti coagulated with heparin and this may be sufficient to run CRRT with heparin in the circuit. Occasionally, there may be an increased requirement of the dose of heparin – also, APTT measures may be inaccurate and anti – factor Xa levels may need to be monitored in some ECMO patients. At the Alfred all ECMO patients undergo CRRT with hemosol/ systemic heparin and not with citrate as there is not enough evidence for safe use of citrate protocol. Q8. Is there any evidence that CRRT changes outcomes in ECMO patients? This is an area of ongoing research. A systematic review from 201411 shows avoiding CRRT in ECMO patients is associated with better outcomes. However this is likely related to the fact that these patients are also less unwell. Many studies investigating this question are retrospective and therefore can only show the association of CRRT and outcomes, and cannot show that a decision to avoid CRRT will make a positive difference.